We’d love your help. Let us know what’s wrong with this preview of Poppy and Sam and the Leaf Thief by Cathon. It's a beautiful day in the garden when Poppy and her panda friend, Sam, hear a commotion. Their friend Basil--who has always been known for his elegance--is in tears, because somebody nibbled his leaves last night! Poppy puts her detective skills to work, with help from Sam, and together they set out to find the culprit. 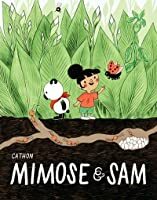 They start by interviewing the insects, but Ms. Hone It's a beautiful day in the garden when Poppy and her panda friend, Sam, hear a commotion. Their friend Basil--who has always been known for his elegance--is in tears, because somebody nibbled his leaves last night! Poppy puts her detective skills to work, with help from Sam, and together they set out to find the culprit. They start by interviewing the insects, but Ms. Honeybee, Madame Ladybug, and Mr. Bumblebee all have contradictory suspicions of their own. So Poppy and Sam test some creative methods to catch the vandal red-handed. After a few misadventures, they find the remorseful nibbler--and Basil helps him understand that everything tastes better when it is freely offered. To ask other readers questions about Poppy and Sam and the Leaf Thief, please sign up. The most important thing I can say about this book is that it features a drawing of an earwig that is downright ADORABLE. Earwigs are not adorable, and yet this book manages to present one that I sort of want to hug. It's an impressive feat. Cute book, too. I don't read a lot of children's book mostly because I'm an adult without any children so I don't really have a need for it. I was browsing Netgalley's catalog for comics and thought this one looked really cute so I requested it. It was definitely a really quick book to read through, which makes sense since it is geared towards children, but I found it so cute! The book is about Poppy a little girl, no quite literally little because she lives in a pumpkin house, that lives amongst nature. The book starts with her and her panda friend Sam picking strawberries, but end up getting wrap-up in a mystery! Some one keeps on eating Basil's leaves and they set out to find out who it is. They set some traps and try to find the culprit red-handed. They have some failures along the way, but the way they end up finding the guilty party was so entertaining. I like that this book shows some failure, because I think it shows to kids that sometimes the first solution is not the best one. Sometimes you have a fail and try again to get things right. I think it also showcases how to problem solve effectively. What I also like about this book is that it doesn't try to "punish" the guilty party. It's a lot of admitting that you have done wrong, and for the other party to accept and forgive when someone has done you wrong. Also about remembering to ask for permission first. I really like that these messages were included in a children's book, because I think they are really important. The artwork in this is very clean, but also since it's in the grass field there is a lot of green in it. It's pretty colorful in the panels with the strawberries or the different flowers. It has a very "soft" pastel style to it that I think makes it really engaging to a kid. If you a parent looking for a good picture book to read to your children that has a good message behind it, I would recommend this one. Poppy and her panda bear friend, Sam live in a garden and are the same size as the bugs in the garden. Their friend Basil, the basil plant, has had someone munching on its leaves. Poppy and Sam are on the case! They start interviewing the various bugs in the garden like the bees, ladybugs, and other creatures. They try to catch the leaf thief in the act, and even set traps. What they discove 'Poppy and Same and the Leaf Thief' with story and art by Cathon is a fun graphic novel for young readers. Little ones will love solving this mystery of who is eating Basil's leaves. The illustrations are really cute! Poppy looks like a little girl who lives in a pumpkin with her panda, Sam. I don't if it is, but it should be a series! Cute illustrations! This book is so cute, it hurts my guts to just look at the illustrations. All jokes aside, this is a sweet book and best of all, it's a mystery! It reminds me of a "WHO DUNNIT" kinda story but there are no dead bodies and it's up to us to find out who's been nibbling on the basil leaves...! Poppy & Sam are waiting for their strawberries to be ready to pick when they stumble onto a mystery of whose eating the basil plants leaves. Can they find the theif? Cute. Elementary and up. Told in speech bubbles. This is an adorably illustrated book with a great cast of characters both plants and insects. I think children would really get a kick out of this book that leaves me reminscient of my childhood favorite, The Smurfs. Someone has been eating Basil’s leaves and Poppy is going to figure out who! J'admire le travail de Cathon, mais cet album, que je considère quand même comme original, m'a un peu perturbé. J'ai trouvé le récit trop facile. C'est peut-être ce qui m'a tué à la lecture. Par contre, les personnages sont attachants et remplis de surprises. Poppy and Sam are hanging out in the garden where they live when they hear cries of distress from Basil--someone has nibbled on his leaves! To find the culprit, Poppy & Sam interview a number of insect suspects, try to stay up all night to catch the thief redhanded (FAIL), and eventually set a variety of traps to find the snacker who has gone after Basil. I don't usually enjoy picture books that are designed in comic book style, but this one won me over. I love the simple cheerful illustrations, and the story is fun; I love all the insects who come into play here! This is a good book for anyone who loves bugs, loves to garden, or just wants a fun, simple book. At first I wondered which plants you were allowed to eat and which ones were sentient. Strawberries = food but Basil = friend. Then it turns out that you are allowed to eat your friends as long as you ask first! I am unsettled. Ok, that's just me being weird. This book is actually gorgeous! I love Cathon's approach to graphic novels for young readers. It feela like a good blend of picture book illustrations and graphic novel dialogue. The character designs are so cute! They feel sort of old-ti At first I wondered which plants you were allowed to eat and which ones were sentient. Strawberries = food but Basil = friend. Then it turns out that you are allowed to eat your friends as long as you ask first! I am unsettled. ADORABLE, soft illustrations that really create the texture of a world you want to dive into even in such a short amount of time/space. Good, low-stakes mystery plot for early readers, and a sweetness that makes it great to add to an all-ages graphic novel collection for readers who enjoy cozy, slow-paced graphics. Poppy, a clever minature girl and Sam, her mini-panda sidekick, solve the mystery of who is eating Basil's leaves. The suspenseful story with its sweet expressive creatures is sure to be popular with preschoolers. The appealing imagery and simple graphic novel format, with only one to four panels per page, make it well-designed for new readers, although the vocabulary is quite complex. Ages 3-7. Cute little graphic novel, and nice little detective work. The culprit isn't a surprise if you know your insects. It has a nice little lesson on being honest and asking for what you want instead of just taking. Because things freely given are always better. Libraries differ on where this book is shelved. Some call it a picture book, but others call it a graphic novel. 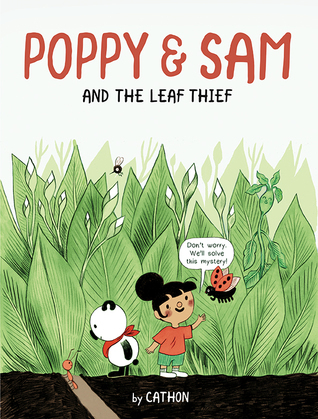 An adorable mystery where Poppy & Sam have to figure out who is eating Basil's leaves. Good for one on one discussion. I don't think that it will work as a read aloud. A wonderful new graphic novel easy reader. Cute little bugs and adorable girl (Poppy) solve a mini mystery. Fabulous inside look at a typical garden. A sweet little detective tale, with an amusingly clever trap for the culprit. Nice for a one-to-one read for a small investigator. A nice introduction to a graphic novel style story. It also has some good lessons for young and old readers. A great intro to graphics to early readers. Cathon's cute cartoon style is super endearing and the story is super cute! There's trouble in the garden and Poppy & Sam are on the case! This book was very cute and I really liked the illustrations. Cute art. Horrible everything else. This story is perfect for that special little detective in your life. It can also help introduce kids to gardening and insects. Great for classrooms or cracking the case at home!